I’m a collector of things - small things, but things, nonetheless, and I love having adorable little jars to put those things in, whether they are dried flowers, small spoons, paintbrushes, or pretty makeup brushes. Lucky for me, I burn through a lot of our candles and the empty candle jars are the perfect fit. Getting the wax out of jars seems like a daunting task, but it takes just a few minutes (perfect for a slow weekend morning task) and the payoff is more than worth it. See below for how to do it yourself! 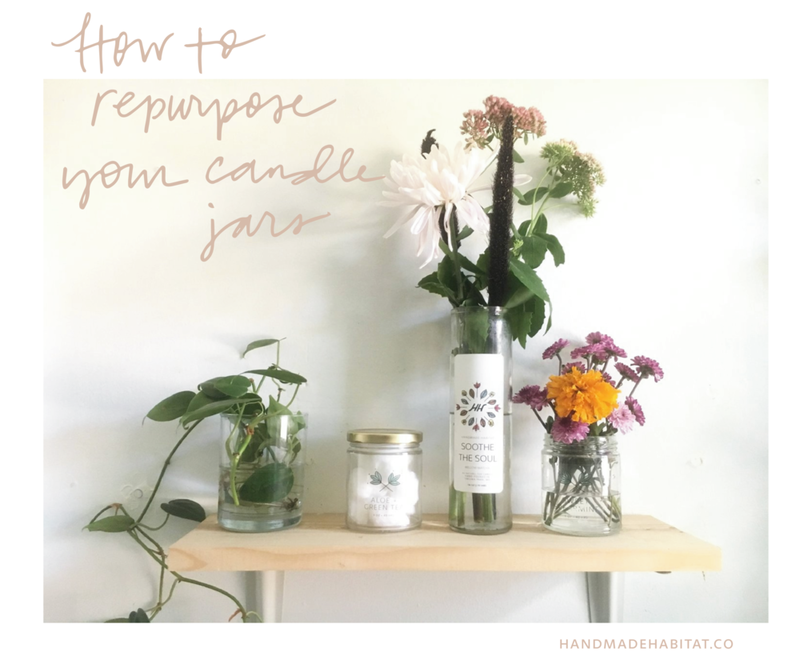 What you’ll want to do is pop empty candle jars into your freezer as you are done burning them. When your candle has reached the bottom 1/4 inch of wax, you’ll want to call it, even if you can burn it further down. Why? Because burning your candle to the itty bitty bottom can cause the glass to become dangerously hot and you’ll want to spare your tabletops the worry or melting. There’s also a small risk that the glass could crack if it gets too hot at the bottom so stopping at 1/4 inch of wax left is a good practice. Step 1: Freeze your candle jars. This will cause the wax to harden and condense a little bit so it’s easy to get it out of the glass. Leaving your jars in the freezer overnight is plenty of time, but I’ll just put empties in there as I have them and then clean them out whenever I get the urge. Step 3: Crack the wax using a spoon and scoop it out of the jar. This can send wax flying (like it did for me above, so just be mindful of that! Dump the excess wax, metal wick clip, and the little sticky bit holding the wick in place into the trash. Step 4: Once your candle is empty, wash with hot water and regular dish soap. You can try to avoid getting too much water on the label if you’d like to keep it intact, but if you’d like to remove the label, running hot water over it is usually enough to peel it off without any residue. If you still have some sticky glue on the jar, you can scrub it off with soap and water. Ta da! An easy fix, and once your jar is cleaned out, you can use it for cotton balls, spoons, bar accessories, bobby pins, flowers and anything else you can imagine. For our local friends, you can also bring your empties back to us at our selling events and get $2 off your next purchase! (No need to clean the jars out yourself if you’re bringing them back!) We use the jars to make new candles, and love having them around for our growing flower arranging and plant propagation projects.